The show saw a 5 percent increase in visitors, with many coming from emerging boatbuilding countries. 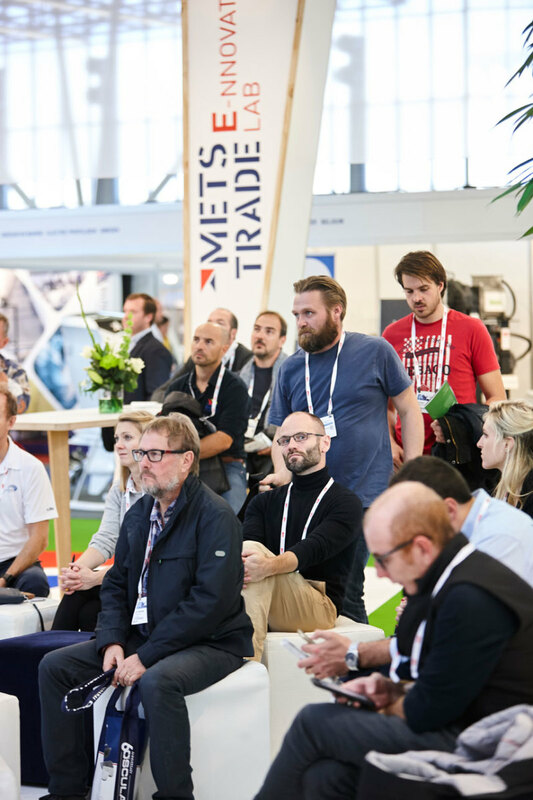 Metstrade set a number of records this year, increasing both its exhibitor and visitor numbers. Organizer Rai Amsterdam reported a 5 percent increase in visits across the three-day event, with 16,716 visitors representing 115 nationalities. The show also had more than 1,600 exhibitors from 50 countries, with 237 companies displaying for the first time. The number of visitors from the United States was up 13 percent compared with last year, while Italian visitors rose 8 percent. More visitors from Russia (up 15 percent) and the United Arab Emirates (up 9 percent) meant that emerging boatbuilding countries were returning to the Amsterdam show for the first time in years. 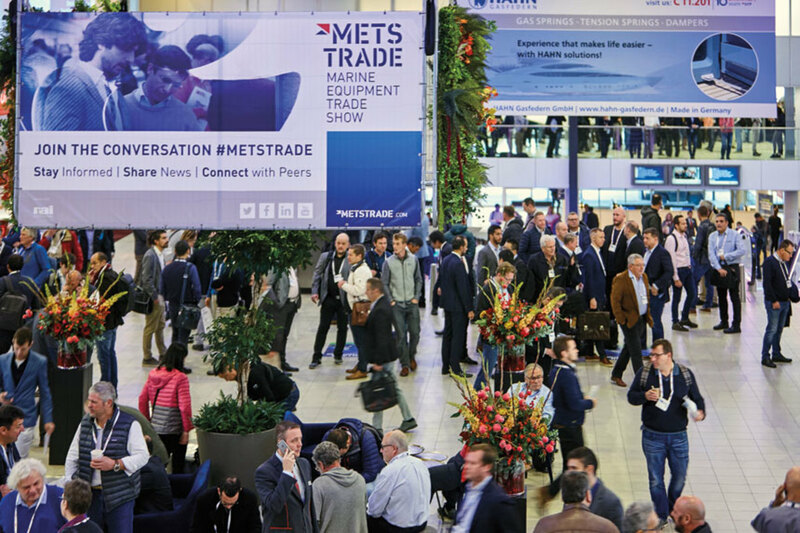 The sense of enthusiasm seemed to permeate Metstrade’s 12 large exhibit halls, which span 721,000 square feet. Only one of the more than 40 exhibitors Soundings Trade Only interviewed said they had a mediocre show. Most comments were not just positive, but glowing. Dolphin Charger designs and manufactures power-conversion products for all types of boats. Like dozens of other companies, it used Metstrade as a new-product launchpad for its Prolite- and Protouch-series battery chargers, and AGM- and Gel-series batteries. The company had exhibited at Metstrade for 15 years, but launched the Dolphin Charger brand in 2015. A number of American companies also make the Amsterdam event their exporting anchor for the year. The U.S. Pavilion had more than 90 exhibitors, with several dozen American companies in other halls. First-time U.S. exhibitors said they were impressed with the show. Seann Pavlik, founder of Innovation Products in Fort Lauderdale, told Soundings Trade Only the day before the show opened that he hoped to sign one or possibly two European distributors to market his line of products. Pavlik wasn’t so sure if the investments in travel and exhibit space would pay off. He was keen to find distributors for his new iLatch, which received an honorable mention in the show’s Dame Awards. More designers, technical personnel and purchasing managers were at this year’s event. The Dame Awards carry a special charm for exhibitors who win or even earn an honorable mention. Sixty-three products were shortlisted for the awards, with six category winners and 23 honorable mentions. Winning a category cuts through the PR noise of hundreds of other launches, giving attendees a small, manageable list of products to see. For Triskel Marine, winning this year’s overall Dame Award could transform the company in almost overnight. The U.K. firm has been in business for 15 years but has built marine products for other manufacturers under private-label agreements. In the past decade, Triskel has been working on the Integrel power management system (see box below), which it unveiled at Metstrade. The earliest versions of Integrel were backed by grants from the European Union, and were for testing the technology’s potential. A few years later, the U.K. government provided more funding that moved the product farther along. But, six years in, Integrel was not market-ready. Wittamore says winning the Dame Award was a game-changer for Triskel because few knew the brand. Suddenly, the small company had a new technology that nobody else was making, but everyone wanted. The team’s booth was swamped with engine makers, boatbuilders and others. Scanstrut, another U.K. company that won the Dame Award in 2017, also saw brand recognition continue into this year’s show. Its award-winner last year was a kit that would instantly convert a sailing dinghy into a sailboat for people with disabilities, including paraplegic sailors. Scanstrut received an honorable mention this year for its ROKK Wireless 12/24V waterproof wireless charging station, a product with broader OEM appeal. Two Italian manufacturers, both suppliers to the superyacht world, also reported unusually strong shows, perhaps in part because organizers expanded the Superyacht Pavilion to three halls this year. Whether it was a greater number of yachts in build or the pavilion’s larger space, more yacht builders, designers, superyacht captains and even commercial shipyards showed up to see the new products and technologies. Palagi introduced its Netto “lightliner,” which provides subtle, targeted LED interior lighting that is reminiscent of an upscale art gallery or Michelin-starred restaurant. Besenzoni had two booths, one in a main hall with the Italian Pavilion and the other in the Superyacht Pavilion, dedicated to Besenzoni’s new Unica brand. David beats Goliath: After winning this year’s Dame award, Triskel Marine expects its Integrel system to redefine the small U.K. company. The company introduced multiple products, including a remote-controlled telescopic gangway, a folding sunroof and the Unica SP 602, which has LED lights underneath each step. Lumishore also showcased its new Smart Lighting, the world’s first DC-powered LED lighting system, which won its category in the Dame Awards. Tony Robertshaw, managing director of IMDS, an Amsterdam-based firm that represents U.S. and other equipment manufacturers exporting into the European Union, said his company was so busy he is considering reducing the number of appointments scheduled before the show, and devoting more time to walk-up visitors. Robertshaw nearly missed an important “delegation” from a UK boatbuilder. IMDS also received unsolicited visits from boating industry representatives from far-flung countries including Russia, Turkey and Kazakhstan. 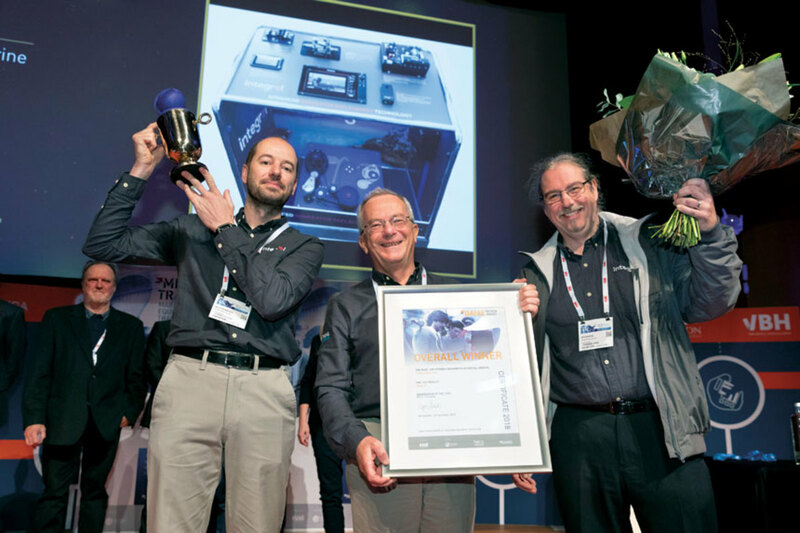 Dozens of products from around the world were entered into the Dame Awards, but only one was named overall winner: Triskel Marine’s Integrel power-management system. 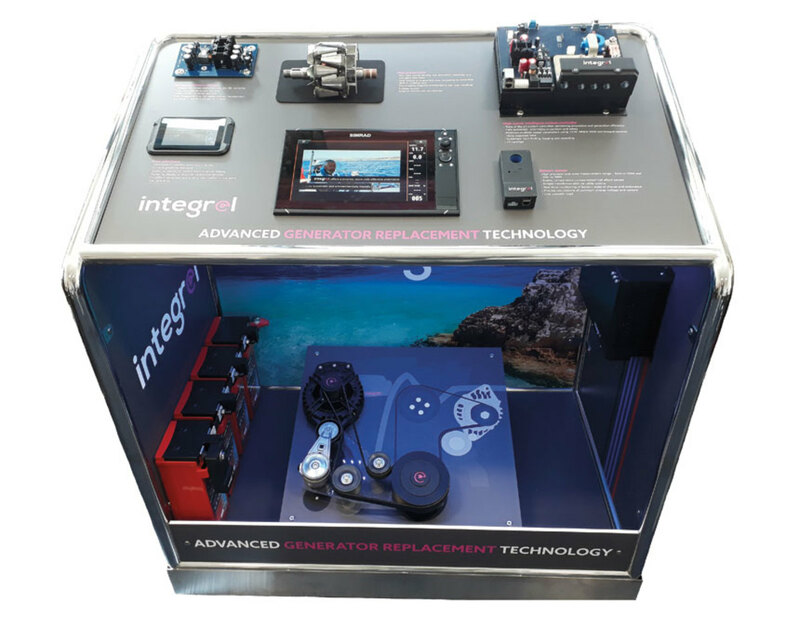 Integrel aims to replace boat generators by channeling spare engine capacity into house systems or batteries. As spare capacity increases or decreases with engine revs, the system adjusts power generation. Integrel is like an alternator on steroids. Integrel is expected to move into production this year after 10 years of development.